Best Season : All time of the year. For see greenery, July to mid-september is the best. For see snow, December to mid-february is the best. Temperature : In summer, 25 degree centigrade(max) and 12 degree centigrade(min). In winter, 10 degree centigrade (max) and 2 degree centigrade (min). 51 km north of Almora, Kausani’s location in the middle of Himalayas, makes it perfect for a close view of the snow clad peaks of Nanda Devi, Trishul, Panchchuli, Nandakot, and Chaukhamba. 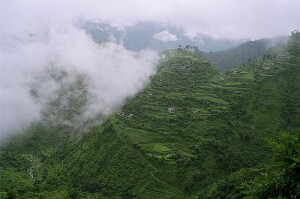 Kausani is Situated at 6,075 ft above sea level. Its pleasant climate, its incredible views and its natural beauty are sure to relax city-weary souls. For the more adventurous there are a range of exciting sports facilities. It is described India’s Swaitzerland. Baijnath and Bageshwar are two famous temples in kausani.The Anashakti Ashram, where Gandhiji spent a few days, is open for public. Road: Kausani is well connected with major cities like Delhi, Nainital, Almora and Ranikhet. Air: Nearest airport to Kausani is at Pant Nagar. Rail: Nearest railway station to Kausani is at Kathgodam. The distance of Kathgodam from Kaushani is 35km. Kathgodam is connected with major cities like Delhi, Lucknow, Moradabad, Dehradun and Calcutta. This entry was posted in Kausani, Uttaranchal and tagged kausani hill station, kausani in uttaranchal, kausani india, kausani map, kausani photo, kausani photos, kausani tourism, Uttaranchal. Bookmark the permalink.